BookLust: Don't Wake the Third Sleeper!! Don't Wake the Third Sleeper!! 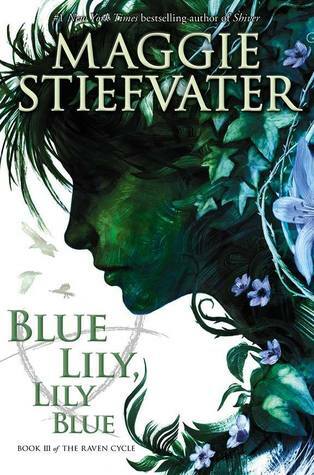 Blue Lily, Lily Blue is the third book in Maggie Stiefvater's Raven Cycle series. I got into this series after Ana, Jenny, Teresa and Memory told me about it, and now I am totally into it, too. Every time I read a book in this series, I start out really cool and disinterested. And then I get further in and. I. Just. Can't. Stop. The characters? They are amaze-balls. I feel like in every book review, I say "Adam!! Ronan!!" And here, I shall continue to say, "Adam!! Ronan!!" I mean, Blue and Gansey are fine, but they are in this whole, "Our love is doomed!" camp and Gansey is everyone's best friend and Blue is the lone girl in the book, and while both of them are fully fleshed-out and interesting characters, I can't help but feel that they're both shallow pools compared to the depths we see in Adam and Ronan. Adam and Ronan separately are wonderful here. Adam really grows up, learns that friends often want to do things for him because they like him, not because they feel sorry for him. There is this scene with his father, and then this scene in a courtroom, and both times, I just wanted to hug him. And Ronan, for the first time in this book, seemed like someone who would maybe accept a hug from people. And the way he works so desperately hard to keep his mom and brother safe... oh, it's so lovely! But Adam and Ronan TOGETHER. That is like, the best thing ever. Seriously, when these two team up with each other, it just makes my heart happy. Blue and Gansey - well, they are feeling all the feelings, but they don't really let that get in the way of the bigger picture. And that's what I really love about this series. Yes, there's a Doomed Romance that is kept secret because the two involved don't want to hurt other people (though, honestly, I don't think the others care very much). But what's at the center of this book is the people and their relationships with each other. Family bonds and friendship bonds more than any other kind. I LOVE what these friends do for each other, in every way. Not just the teenagers with each other, but the adults with each other and the adults with the children. There are friendships on all levels and across multiple generations here, and they are all beautifully written. I can't wait to see what happens next. Megan, I think you would really enjoy the series, so definitely think you should check it out. Adam! And Ronan! Ugh I love them so much together. I loved them together before I knew that Ronan was into Adam, because there is so much respect there for each other's boundaries, and also very little putting up with each other's crap. That is excellent between those two. Yes! I love how they challenge each other on the stupid boundaries and respect the important ones. I love how Adam stayed in the church because he didn't want Ronan to be alone, and then Ronan showed him that horrible scary scene, and then Adam called him on his idiocy and walked away. And then they were both fine and there was no drama. Which is why I don't think that Blue and Gansey need to worry about all the drama because I feel like Adam and Ronan won't care nearly as much as expected. I wish I could wake up extinct Irish elk just by saying "Wake up!" And then ACTUALLY RIDE ONE. Thanks for the warning; I haven't gotten to the night where I can't quit reading it yet, but I must be close. Get ready, Jeanne. The Elk are coming! I blew through Blue Lily, Lily Blue in roughly five hours straight but spent a week on my review. What is there to say besides "it's awesome!" that doesn't give anything away. I'm also really happy about Adam and Ronan. Going in I wanted it to happen, but I didn't think it could. Coming out, I was convinced that it would happen. Yes! The relationships are absolutely what make this series so great, especially because the Blue/Gansey relationship is not really given any more weight than the others. And I agree that Adam and Ronan won't care as much as Blue and Gansey think. I can see Adam being temporarily annoyed, and then even more annoyed that Gansey thought he wouldn't be able to deal with it. But he'd deal. And I like Adam and Ronan together, but I think I prefer them together as friends. That's more interesting to me and is in keeping with letting friendship be as important as romantic love in this series. Turning the four living main characters into two couples seems too tidy and predictable. This is such a great series. I am thrilled to see it getting the praise it deserves! I'm just not even starting this series until it's all written and I can read all the books in a row. Because I can already tell I'm going to need to do that.